Okay, by now you have probably gotten the point. 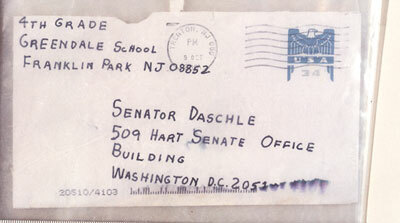 The Anthrax letters came from inside the United States. 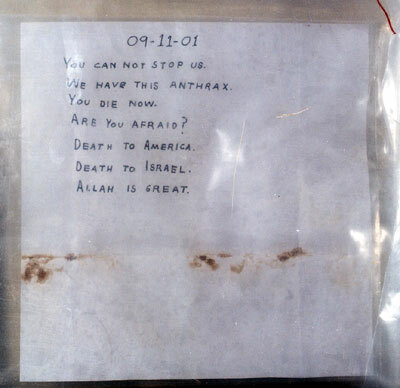 The letters contained a specific type of weaponized Anthrax made by a United States military lab which had been claiming for a lot of years that it wasn't doing that sort of thing any more. "What? Oh, you mean THAT Anthrax over there! Sheesh, we thought you said 'Pamflax' and shuckies but we quit making that stuff a long time ago. Honest. Really. If we're lying may God strike us... a glancing blow." 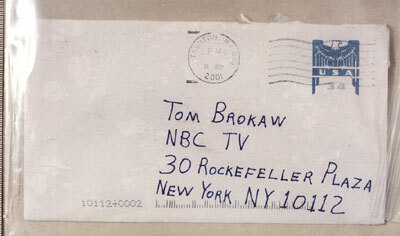 The pattern of the mailings of the Anthrax letters was also suspicious. Congress got their Anthrax letters just in time for the vote on the disingenuously named USA Patriot Act (aka the anti-terror bill) which the terrorized Senators voted into law without bothering to read. How convenient for the bill's sponsors that there was a terror attack on the Congress just when Congress was about to vote on the anti-terror bill. Eerie timing, isn't it? "After the September 11, 2001, terrorist attacks, the Bush Administration tried to ram the USA PATRIOT Act through Congress," [Francis A.] Boyle said in a radio interview with Austin-based talk-show host Alex Jones. "That would have set up a police state. Senators Tom Daschle (D-South Dakota) and Patrick Leahy (D-Vermont) were holding it up because they realized what this would lead to. The first draft of the PATRIOT Act would have suspended the writ of habeas corpus [which protects citizens from unlawful imprisonment and guarantees due process of law]. Then all of a sudden, out of nowhere, come these anthrax attacks." 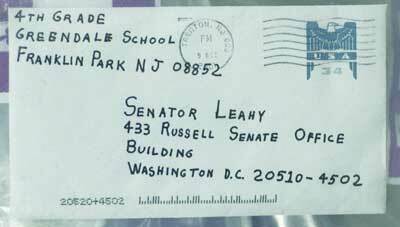 So now, knowing that the Anthrax letters came from an American source, take another look at the actual letters (click images for full size). There are several indications of deliberate deception in these items. A terrorist group seeking the maximum number of casualties would not advertise the fact that the letters contained a biological weapon, they would have enclosed an innocuous letter to ensure maximum spread of the agent - the letters are virtually shouting "seal off the area and get a doctor!" The addresses are written at a slight slant, oddly enough matching the look of the posters and flyers at the Post Office warning all America to "watch out for these". While the letters to Congress are intended to appear to be from fourth graders, the letters to the New York Post and Tom Brokaw have no need for such an artifice. Dates written by Middle Easterners begin with the day first, then the month, then the year, therefore the date should read 11-9-2001. The above letters follow the American convention for the dates shown. One of the letters is a photocopy of another. Most places which have copiers have typewriters or word processors, appliances whose operation is no mystery to the sort of people who go in and out of government laboratories. 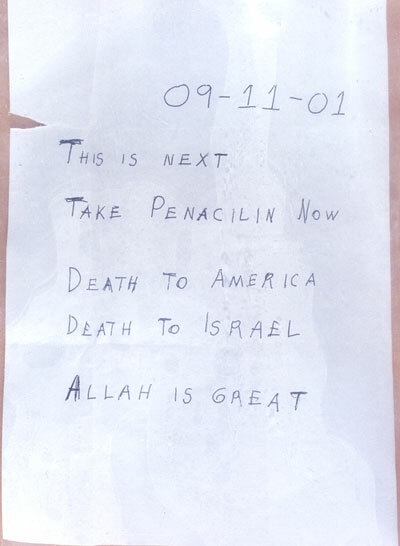 In short, the entire look of the letters is a contrived fake, creating what they thought a letter from a third world middle eastern terrorist would look like, so that the phrases "Death to Israel", and "Allah is Great" (a real Muslin says either "Allah Achbar" or "God is Great") would point the finger of blame for the Anthrax at the middle eastern Arabs. Except that we know for a fact that the Anthrax didn't come from the Middle East. It isn't Saddam's or Osama's, it's the very best high quality mil-spec Anthrax home grown at Fort Detrick, Dugway, and USAMRIID. 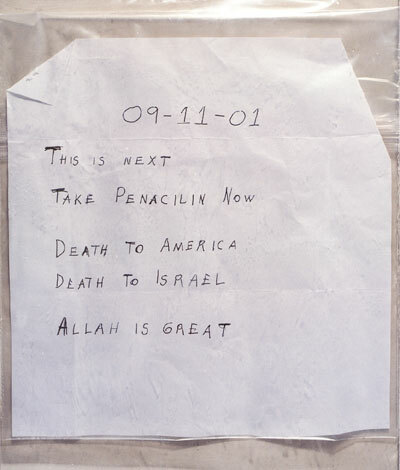 And that means that all the slanted writing, the extra crossings on the "T"s, the references to Allah and Israel are a carefully crafted hoax, designed to trick Americans into thinking that Arab Muslims from the middle east were to blame for the Anthrax letters. 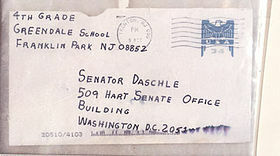 The above letters are not evidence of a terrorist attack but of a deception against the people of the United States; a deliberate frame-up of middle eastern Arabs perpetrated by the same party who owns the Anthrax. That a plan exists to frame Arab Muslims for the crimes of another party is now a proven fact. 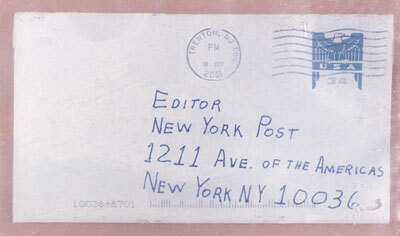 There are two suspects accused of being the source of the Anthrax letters. The first is Dr. Philip Zack, who was caught on camera entering the storage area where the Anthrax was kept without proper authorization. The second suspect is the more well known Dr. Stephen Hatfill, accused (and re-accused and re-accused) by Dr. Barbara Rosenberg although no actual evidence of his involvement has surfaced. But regardless of whether one thinks Dr. Zack or Dr. Hatfill is the culprit, neither man is an Arab Muslim, which again means that the above letters, written to appear to be from Arab Muslims, are proof of a plot to frame Arabs for terror attacks in the US. The only question is, did that plot extend to 9-11 itself.